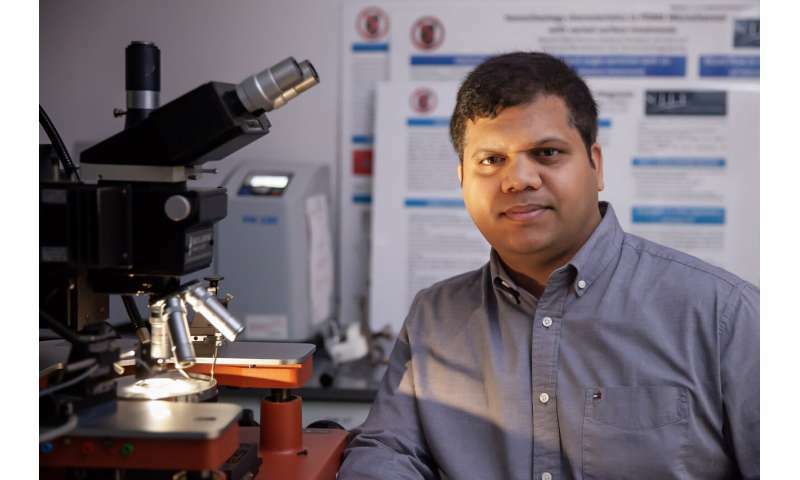 "Ideally, there would be a simple, inexpensive test—performed at a regular patient visit in the absence of specific symptoms—to screen for some of the more silent, deadly cancers," says Bharath Babu Nunna, a recent Ph.D. graduate who worked with Eon Soo Lee, an assistant professor of mechanical engineering, to develop a nanotechnology-enhanced biochip to detect cancers, malaria and viral diseases such as pneumonia early in their progression with a pin prick blood test. Their device includes a microfluidic channel through which a tiny amount of drawn blood flows past a sensing platform coated with biological agents that bind with targeted biomarkers of disease in body fluids such as blood, tears and urine—thereby triggering an electrical nanocircuit that signals their presence. Nunna is now a postdoctoral research fellow at Harvard Medical School, where he is expanding his expertise in microfluidic platforms, using them in organ-on-the-chip research conducted with Su Ryon Shin, a principal investigator and instructor in the medical school's Department of Medicine who develops 3-D-bioprinted organoids—artificial organs composed of cultured cells within structured hydrogels—for medical experimentation. "I'm primarily responsible for developing the microfluidic devices that will automate the process of bioprinting 3-D organs that will be incorporated on a chip for a number of purposes. I'm tasked, for example, with developing an automated platform for long-term drug efficacy and toxicity analysis to track liver cancer and cardiac biomarkers. I'll be integrating the microfluidic biosensor with the liver cancer- and heart-on-a-chip model for continuous monitoring," he says. By measuring the biomarker concentrations secreted from drug-injected 3-D-bioprinted organs, we can study drug effects on several organs without harming a live patient. Creating artificial organs allows us to experiment freely." Down the road, he adds, the work at Harvard could potentially be applied in regenerative medicine. "The goal is to develop fully functional 3-D-bioprinted organoids and clinically relevant 3-D tissues to address the issue of donor shortages in transplantation."